Yes! We offer two great stabilization solutions for FPV flyers. If you plan on using an OSD with FPV, we recommend the Vector OSD, with built-in Guardian stabilization. This gives you integrated FPV stabilization with AHI (artificial horizon) display, easily adjusted with on-screen video menus. Servo compatibility notice: Eagle Tree has received reports that some instances of the E-Flite™ model EFLR7155 servo do not work correctly with the Guardian (and some similar devices) due to higher than normal loads placed on the servo signal line, while other instances of this servo model do not exhibit this behavior. Symptoms can include sudden, uncommanded servo movements. Therefore, we cannot recommend using this model servo with the Guardian. Q: I want one for each of my models! When and where can I buy it?? 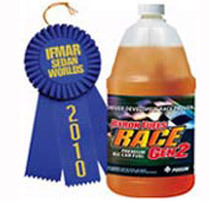 Contact your favorite RC dealer, or order direct from us if a dealer is not in your area. 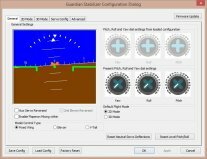 Click here for the Guardian 2D/3D Stabilizer thread on RCGroups.com. Eagle Tree is very interested in how we can improve our products to meet your needs. Just post your request on the Guardian Stabilizer thread here, or click here to email us and let us know what you need! * Note: a standard "micro" USB cable, used commonly with mobile phones and eBooks, is not included but is required for PC configuration and firmware update. You probably already have one, but if not, you can purchase it from us or elsewhere.